That said, is inflation running higher than I expected? Yes. Am I worried that this might be the beginning of a runaway inflation process? No. Do I sound like Donald Rumsfeld? Yes. The IMF study of PLOGs “” prolonged large output gaps “” pretty much summarizes my own views. You expect a persistently depressed economy to have falling inflation, although it tends to level out at a small positive number. There can be episodes of rising inflation along the way, however, but these normally reflect special and temporary factors, usually oil prices and/or currency devaluation. US experience mostly fits this pattern, although I now believe that there’s an additional special factor that isn’t typical: the prolonged slump in home construction has now created a bit of a shortage, so rents are rising “” and since implicit owners’ rent is a major part of core inflation, that’s causing a pickup over and above the effects of oil prices. Question: What’s happened to American housing prices over the past 5 years? Answer: According to Case-Shiller they’ve fallen by 31.6%. Question: And what’s happened to housing construction over the past 10 years? Answer: According to this graph provided by Matt Yglesias, housing construction has been unusually low during the past 10 years, when compared to previous decades. So why is housing causing a problem for the Krugman model? The answer is simple; the BLS doesn’t agree with Case-Shiller, they don’t agree that house prices fell 31.6%. What kind of figure did the BLS come up with? I’m afraid you’d better sit down for this. The BLS doesn’t claim housing prices fell 7.7% since mid-2006, they claim they rose by 7.7%. Just a minor 39.3% discrepancy with C-S.
Now I’m sure people will tell me that the BLS uses a different methodology. They look at rental equivalent. But that’s still a pretty big discrepancy. Now let’s consider an argument frequently made by commenters; real wages are falling, whereas my sticky wage model (supposedly) predicts they should be rising. (Actually it doesn’t.) Consider two brothers, one who graduates from high school in 2006 and makes $40,000. He buys a house for $150,000. The younger brother graduates in 2011 and makes $43,000. He buys a similar house for $100,000. Who’s better off? The BLS says the older brother, because real wages have fallen. And that’s because the cost of living rose by more than the wage rate. But whose shoes would you rather be in? Now it’s quite possible that the younger generation is worse off than 5 years ago. But not because real wages are falling, rather because they have worse jobs, fewer hours, or are completely unemployed. PS. By the way, the minimum wage has increased 40% since 2006. PPPS. Someone sent me a chart showing that 10 year TIPS spreads in Europe have fallen to 0.6%. Can one of my European readers confirm this stunning data point? Thanks. This entry was posted on September 19th, 2011 and is filed under housing market, Inflation, Misc.. You can follow any responses to this entry through the RSS 2.0 feed. You can leave a response or Trackback from your own site. The size of a house has expanded DRAMATICALLY across the time horizon of your chart. You’ve got the argument wrong ONCE AGAIN. The argument is that we have misdirect far too much capital in production processes over far too long of a time horizon — SIZE MATTERS when you are talking too much or too little at the margin. You are NOT comparing oranges to oranges where you are comparing the capital directed toward the long term in a tiny 1970 house compared to a gigantic, granite filled 2005 house. “Housing Starts” are NOT the same as “Houses Under Construction”, as I’ve pointed out to you many times, Scott. Please look at the graphs and explanation at Calculated Risk so you finally get this straight. do you want TIPS in Europe or Inflation Protected Securities linked to European CPI? 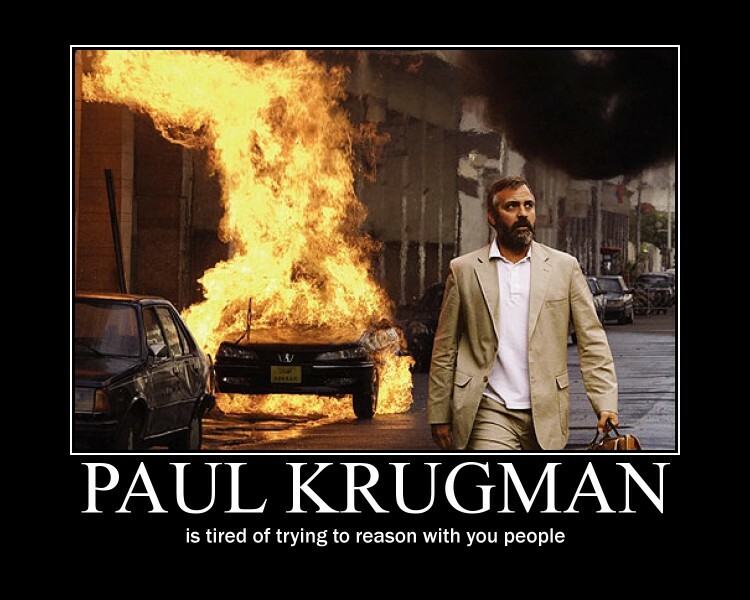 “Some days it must be hard to be Paul Krugman. The death threats, the trolling, the being mistaken for Thomas Friedman (and vice-versa), the being ignored by the people who could most benefit from his advice – or rather, the people who could do the most good with his advice. The simple explanation for why inflation isn’t falling is that output isn’t as far from the “potential” as we would think. FOr instance, Laubach-Williams defines potential GDP by correcting for the stance of monetary policy and whether inflation is rising or falling. Above, that analysis suggests only a -1.3% output gap in the 2nd quarter. I just did a simple model regressing QoQ change in GDP deflator against its lag and this output gap. Output gap has a t-stat above 3. If the output gap were zero, then QoQ annualized growth in Q2 would have been 2.65% instead of 2.5%. Not exactly a huge economic impact. The largest impact in recent years was -0.4% in Q1 2009 when the output gap was -3.6%. If C-S is right, then inflation as measured by the BLS is overstated and inflation may well be declining. And as I’ve responded to you many times it doesn’t matter–houses completed tell an almost identical story to houses started. Matt Yglesias showed the changes in house size don’t have much impact on the results–I direct you to his blog. Andrew, I’m interested in the difference between a 10 year eurobond and a ten year inflation adjusted eurobond. Mark, His post sounds much more interesting. John, Then how do they explain all the unemployment? Foosion, Yeah, I’d say so. But then I don’t think inflation is a very meaningful concept, so one arbitrary figure is as good as another. The bonds that include “index” in their name, are indexed to the harmonized consumer price index without tabacco as published by EUROSTAT. As you can see, the spread is about 1.35% for 8 years and 6 months (as of 9/19/11). A house represents the value of (mostly) future shelter consumption. Change the discount yield and the price will change. Rents represents current cost of shelter. They tend to move much more slowly and mostly up. Obviously the younger brother made a better investment so he’s likely better off, but that’s not very relevant. He is also probably able to buy equities at better multiples, so what? I agree there are several problems with CPI, but I think this is a bad example. If CPI is systemically wrong, every single argument you ever made that relies on TIPS spreads is wrong as well. From the beginning I’ve been arguing that inflation is a pretty meaningless number, or at least it doesn’t mean what we tend to assume it means-the change in the price of goods and services produced by American labor. This is patently wrong, at least with respect to CPI. At least, I think if you ask any economist what CPI means, they’ll say it’s a price index of American consumption, not production. In that sense, of course, it’s the wrong measure against GDP, but that makes it misused rather than misunderstood or meaningless. Laubach-Williams potential GDP doesn’t attempt to explain unemployment. It follows some other Kalman filter literature by calling potential output the “level of GDP that is consistent with unchanged inflation in the absence of relative price shocks”. So if there is unemployment, but no deflation, then real GDP equals potential GDP. So it only incorporates unemployment into the estimate to the extent that the unemployment gap impacts inflation. I suppose one problem is that they are trying to measure the natural rate of interest and hence use that as an indicator of the stance of monetary policy. Might make for an interesting paper to re-work the analysis using nominal GDP expectations as the indicator for monetary policy. Rents are based on income. Thanks Benjamin and Andreas, I thought that data point seemed wrong. acarraro, For 30 years the younger brother will have lower mortgage payments. How is that not a lower cost of living? In any case, what interests me is the price index of stuff produced by American workers–“rental equivalents” should not be in that index, as they are not produced with American labor. Tomasz, Nice try but wrong. I have consistently demanded that the government create and subsidize an NGDP futures market, precisely because the CPI is so flawed. But I’d never argue there is no correlation between the CPI and NGDP. So if that’s all we have, it can be one of many indicators used to estimate expected NGDP growth. MikeDC, I said most economists were aware of the oil price bias, but I don’t think they realize how many other flaws there are in the CPI. You see many economists in the media talking about CPI inflation and Fed policy, as if the Fed should be concerned with the CPI. But why should they say this, if these economists did in fact realize the CPI is as flawed as you say? John, Thanks for that info–but that seems to be a strange way to define slack. The key elephant in the room which you pretend does not exist is the misdirection of resources and the discovery of false prices — processes that take time. The idea is that we misdirected resources & created a systematic discoordination of the system by putting too many resources into extremely long period production goods _HOUSES_. Size does matter in the context which is causally relevant — it may not matter in irrelevant contexts that assume some alternative to thinking in terms of inter-related heterogeneous goods coordinated — or discoordinated — across time in a complex net of relations. The “economic way of thinking” comes into play here across time & across rival uses of resources across time. This economic coordination problem seems impossible for modern macroeconomists to even imagine, but it is at the core of economic coordination in the production goods using economy. And his chart puts an “Index” on the vertical axis. These aren’t raw numbers. What is it an “Index” of? Because an economist has used the same letters, e.g. “h o u s e s” they think they are denoting the same thing from one decade to the next. Population thinking is impossible for the economics. Biologists instinctively think in terms of population which are changing in characteristics across time. Across time “families” have changed. People are getting married later. All of these things change the other side of the “house” / housing situation. Demand changes. So does the content of the supply. A social constructed index with “housing” on one axis across 4 decades hides more than it shows ..
You can think about this in two ways. You can think about this in terms of misdirected heterogeneous resources and false price signals — or you can pretend you are Stalin with a 5 year plan pulling the correct numbers of houses and ever other “aggregate” needed out of the back of your pants. The folks who are making the “we built too many homes” argument are using the economic way of thinking to think about plan coordination across time involving heterogeneous production goods. To “counter” this with an Stalin-eye view about how big the pile of broad category of goods should be is a giant failure to see the topic of discussion. Many right-wing economists have long argued that the CPI overstates inflation. Maybe by a lot, if the BLS assumes house prices have been rising, when in fact they have been plummeting. This does raise questions about interest rates—-are investors accurately measuring inflation, and thus lending for reasonable rates? That’s why you use bank debits. These transactions included both existing & new home sales. This target would have prevented the housing boom-bust. See: Article: Member Bank Reserve Requirements — Analysis of Committee Proposal; published — Feb, 5, 1938. This research paper was DECLASSIFIED on March 23, 1983. To answer your question about inflation expectations in Europe: according to Bloomberg, the spread between 5-yr nominal and real government bond yields in Europe today is 0.7%. As recently as last April this same spread was 2.0%. That is a significant decline. If your still reading this, it is very possible to have high unemployment and high inflation. Buy an Economist magazine and look in the back where they keep the econ data. Countries with high unemployment usually tend to have higher inflation. This doesn’t prove a positive correlation but usually countries with high inflation pursue bad policies all around. In any case, inflation most certainly is not a case of full capacity utilization or some kind of over heating economy. It usually just has more to do with the government printing money. For an explanation of the link between inflation and unemployment, I suggest the chapter on inflation (I believe its Chapter 10) in Milton and Rose Friedman’s “Free to Choose”. Greg, You reject all economic data and then tell me you know you are right because you’ve looked out your window in OC. But when I checked real estate ads in OC I found you were wrong, houses are really expensive there. Scott, Thanks, but I keep getting conflicting answers from people. It reminds me of traveling in Europe–to an American everything seems confusing.